Bronze moreen lined infant's shoes with white homespun wool. Bound with pink silk. Excessively small. Would fit a doll. 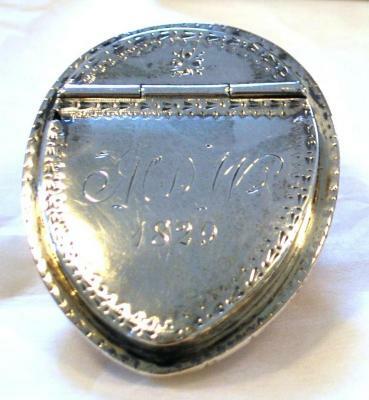 Oval shaped patch box, made of silver and cowrie shell. 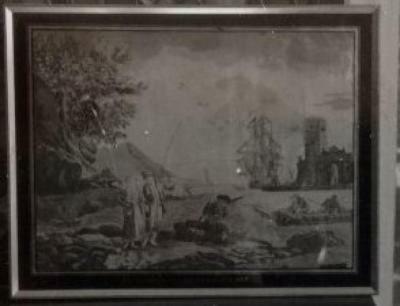 Engraved with the initials "MDW 1829". 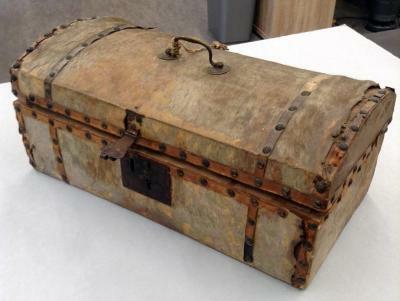 Originally owned by Captain Samuel Fales Hazard (b.c. 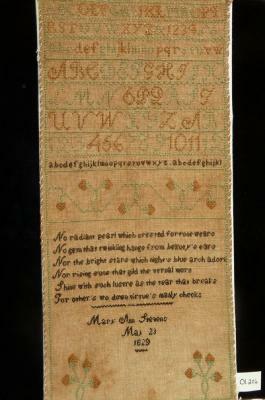 1803); for his fiancee, Martha DeWolfe. Four alphabet sequences, stylized border. Stitches used: cross, queen, Irish. Made with silk thread on linen. 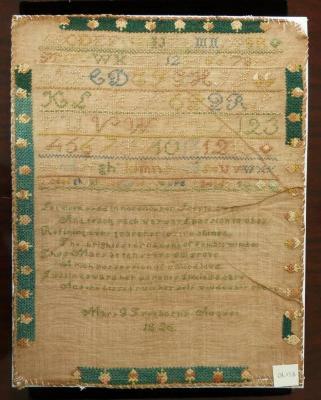 Sampler reads, "Susan Jane Robinson born March 12th 1818 aged 10 Yrs 1828." White satin wedding dress. Low neck, puff sleeves. Collar of plain bound scallops. Worn by Emily Pitman at her marriage to Simon Newton in 1827. 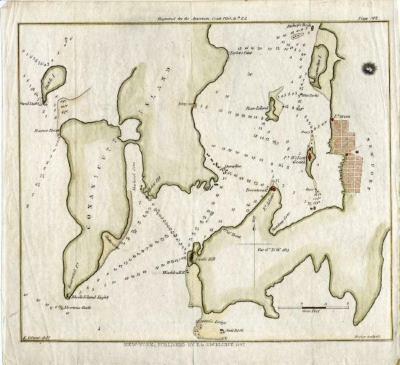 Map of the East Passage (Narragansett Bay) and surrounding area, including Conanicut Island, Newport, Dutch Island, and Rose Island. From "American Coast Pilot," 11th edition, 1827, page 92. Black satin front. Brown linen back with buckle. 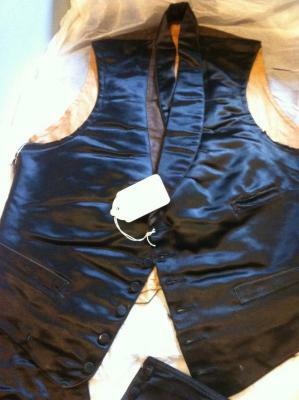 Six small black buttons on lower front, three pockets. 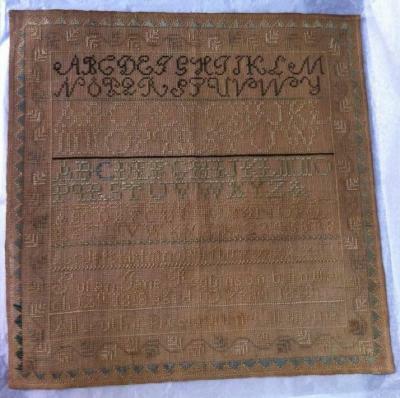 Four alphabet sequences, two number sequences, one verse. Incomplete queen stitch border. Stitches: cross and queen. Made in Newport, RI. See: Bolton & Coe, p. 159. A small silver ladle with R.W. James engraved on handle. Biscuit marker with round wooden base with handle; many metal points on bottom. Comb cleaner with carved ivory handle has two holes in top, horse hair bristles attached to base of handle. 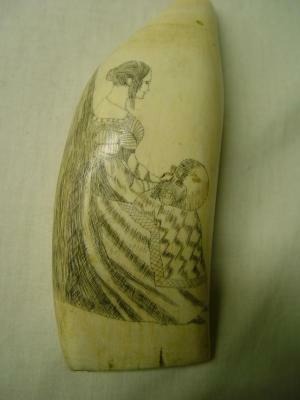 Made of bone, possibly whale, and horsehair. Empire-style sofa with carved feet; faded silk damask upholstery; seat rail continues to form arms at either end. Probably made in America. Bust of Gilbert Stuart. 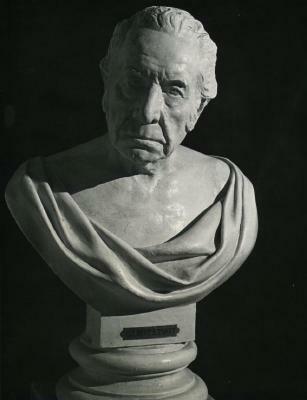 Short, brushed back hair; dominant nose, mouth hangs into slight frown; wrap across chest; "life mark". Four alphabet sequences, house and trees, one border. Made of silk thread on linen. 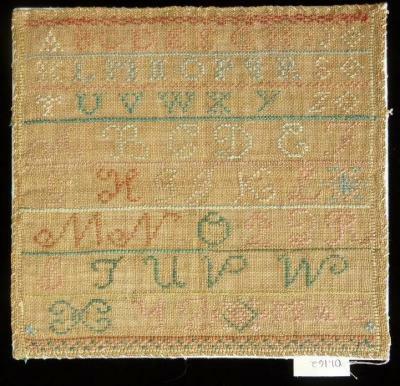 Two cross stitched alphabet sequences, good color, one border. Signed with the initials, M.A.G. Lemon squeezer comprised of two hinged, flat pieces of wood with handles; one has a hollow with holes, the other has a raised mound to fit into the hollow. Sleeve hoops in white cotton with reed or rattan hoops used to extend puff sleeves. Portion of patchwork, "Jobs Trouble" printed cotton. Design includes US Eagle and a general in uniform with a border of stars. Embroidered belt for ladies dress. Neutral or yellowed with embroidered colored silks. Linen gauze lined with linen. Bound brown ribbon embroidered with flowers in colored silks. Flared handle, three sets of double incised lines around middle and bottom of pot. Handle painted black. Lid has a wooden ball on it. Two candle holders of silver Earthenware (Lusterware) with a square base and copper-like holders. Mahogany fold-top card table on lyre-shaped pedestal; platform base has four scroll-shaped feet with acanthus leaves and paw feet; carved flowers on corners of apron and side of base. Silver Earthenware (Lusterware) caster ; gadrooned all around sides; tapered bottom set on round pedestal.